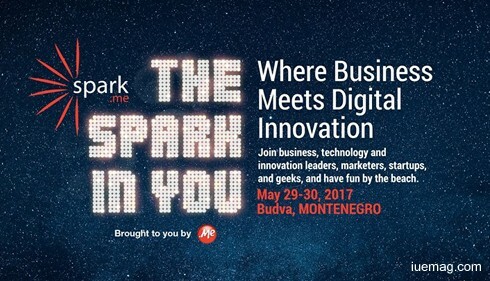 Spark.me is one of the most carefully curated tech/business conferences in South-East Europe. The conference has been organized annually since 2013, in Budva, Montenegro by Domain.Me, a private company which is in charge of Montenegro’s national internet domain – .ME. Spark.me stage, in previous years, welcomed some of the world’s most renowned speakers: Pankaj Ghemawat (one of the world's leading authorities on global strategy, and a TED speaker), Christopher Fabian (co-founder and co-lead of UNICEF’s Innovation Unit, and one of 2013 TIME Magazine’s 100 most influential people), Brian Solis (a principal analyst at research firm Altimeter Group, and a bestselling author), Scott Berkun (the bestselling author and a speaker), Alf Rehn (internationally recognized business thinker, an author and a speaker), David Armano (Global Strategy Director: Key Accounts at Edelman Digital), Tony Conrad (co-founder and CEO of about.me, and Founding Venture Partner at True Ventures), Sara Rosso (Director of Marketing at Automattic, provider of online services such as WordPress.com, Akismet, Gravatar, and many more), Veronica Belmont (an online media personality, a startup advisor, speaker, and podcaster), Peter Sunde Kolmisoppi (hacker/artist who deals with questions of intellectual property rights, best known for being a co-founder of The Pirate Bay), and J.B.M. Kassarjian (management professor at Babson College, and IMD International, Lausanne). A successful conference is built on more than just good speakers and a good agenda (though, with Spark.me, we certainly promise both). It is also about the people who attend, and in the way they interact - to use industry jargon, network. The Spark.me conference is designed to inspire you, to ignite your imagination, and to let you find YOUR spark – the one thing that makes you special, that one idea that will make you stand out from the crowd, along with the people you need to know to make that happen. The iUeMagazine team is delighted to work with Spark.me as Online Media Partners & is expected to bring Unlimited Inspiration for all readers from the proceedings of this event. Staying tuned to the enriching updates from this event is recommended. Join us on May 29-30, 2017 in Budva, Montenegro! Any facts, figures or references stated here are made by the author & don't reflect the endorsement of iU at all times unless otherwise drafted by official staff at iU. This article was first published here on 2nd April 2017.